If there's one thing that you know about Republican front-runner Donald Trump by now — and you probably already do — it's that he'll say or do virtually anything he wants to get propel himself through a debate, rally or interview, all the while safe in the knowledge that he can reel it back mere hours or days later. He's proved that his throngs of supporters won't really blink at any sea change for the candidate. But those who pay attention can find some interesting similarities and through-lines. For example, when Donald Trump questioned Mitt Romney's Mormon faith on Friday, he wasn't just making one of his random, blustery attacks. Rather, he was continuing a trend of religion-based jabbing that he's indulged in before. Here's what happened: Trump was speaking at a rally in Salt Lake City, Utah on Friday, one of the most heavily Mormon places in all of America (it's the site of the church's headquarters). Romney, the former governor of Massachusetts, is also a prominent and lifelong member of the Mormon religion. Romney has been a frequent punching bag for Trump lately, thanks in large part to a scathing speech the former GOP presidential nominee gave earlier this month that denounced the billionaire businessman as a "fraud," a "con man," and a "fake." 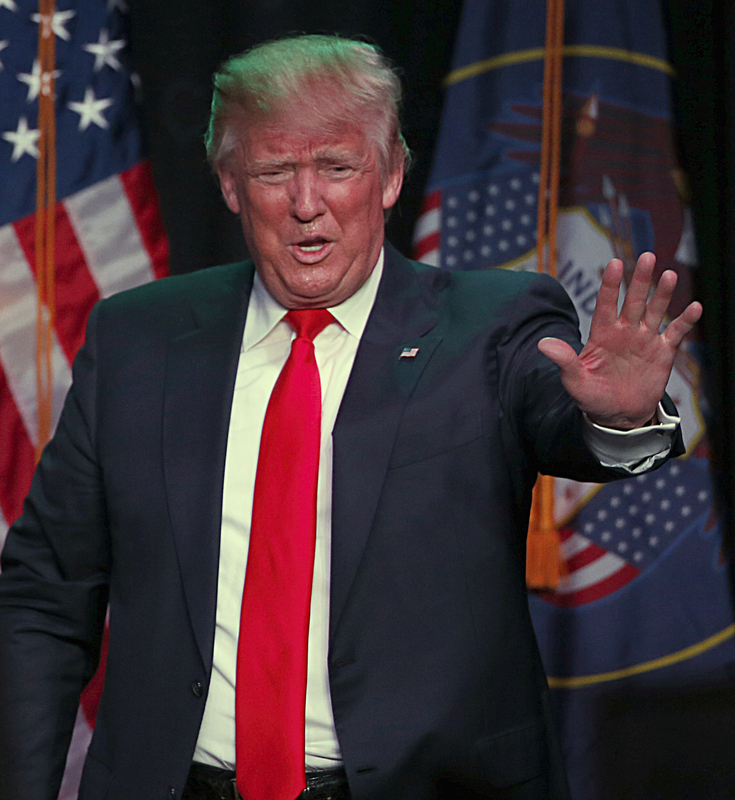 So, while addressing the Salt Lake City crowd, Trump took a shot of his own. And do I love the Mormons, ok? Do I love the Mormons. I have many friends that live in Salt Lake, I have a lot of friends. No, I have a lot of friends. By the way, Mitt Romney is not one of them. Did he choke? Did this guy choke? He's a choke artist, I can't believe. Are you sure he's a Mormon, are we sure? He choked, he choked, it was so sad. It's worth noting, in fairness to Trump (a fairness he doesn't always seem to extend to others), the thrust of his joke was seemingly that a true Mormon wouldn't have "choked" in such a fashion. Of course, it's not at all accurate to say Romney choked ― his loss in 2012 was entirely explicable, given the polls and the political realities― and it's still needlessly personal and inflammatory to jab at his faith in that way, considering it's one of the few areas of personal conviction for Romney that no one has ever questioned. And it's not the first time Trump's done this sort of thing. For a far more barbed example, you need look no further than his attack on then-Republican rival Dr. Ben Carson's faith ― Carson is a Seventh-day adventist, a minority Christian sect that's not quite as instinctively familiar to conservative evangelical voters as, say, a Baptist or a Presbyterian would be. And during an October campaign stop in the state of Florida, Trump tried to exploit this fact. I'm Presbyterian, can you believe it? Nobody believes ― I'm Presbyterian! I'm Presbyterian! I'm Presbyterian! Boy, that's down the middle of the road, folks, in all fairness. I mean, Seventh-day adventist I don't know about, I just don't know about. Trump responded to the ensuing criticism by insisting all he meant was that he literally didn't know anything about Carson's faith, denying that there was any implicit mockery, criticism, or smear there. You can watch the video yourself and be the judge. In other words, this is a game that Trump's no stranger to. In fairness, if you're looking for a silver lining, Christian denominations seem to get off a lot more lightly with Trump than, say, the Islamic faith does. His rhetoric on that front is uniquely vicious, right down to praising debunked stories about shooting Muslims with bullets dipped in pig's blood. In fact, many foreign diplomats are reportedly terrified by the prospect of his election. Needless to say, it's all far worse than tawdry ― even in the instances that seem more minor.